English: The Naval Jack of the Republic of China since 1928 (canton of the Flag of the Republic of China), now used on Taiwan. 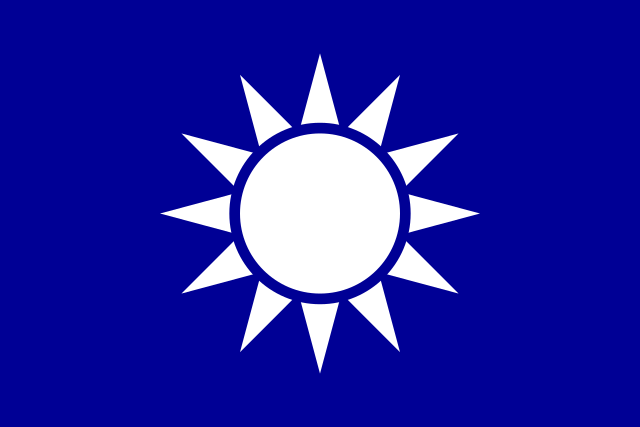 This flag is also used as the party flag of Kuomintang. Bân-lâm-gú: Tshing-thian Pi̍k-ji̍t-kî; Tiong-huâ Bîn-kok Kok-bîn-tsìng-hú hái-kun lām-siú-kî. This image appeared on English Wikipedia's Main Page in the Did you know? column on 6 March 2004 (see archives). 2017-nî 10-goe̍h 6-ji̍t (Pài 5) 23:28 900 × 600（2 KB） Wrestlingring Changed colors to match flag.